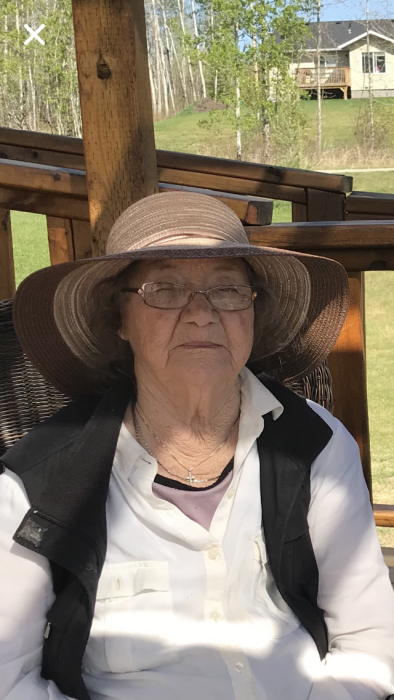 On Monday, January 21, 2019, Elene Agnes “Aggie” Blyan of Buffalo Lake Metis Settlement, passed away at the age of 89 years. Aggie Is survived by her children; Theresa, Darlene (Bobby), Donna (Hector), Carol, Harold (Brenda), Sharon (Norman), grandchildren she raised; Raimona, Shawn, Shane, Dustin, Colten and Torren, 31 grandchildren and 49 great-grandchildren and 1 great-great-granddaughter, 2 sisters; Mary Blyan and Roseanne Ambrose and 1 brother Norman Lewis, as well as numerous nieces, nephews, cousins and friends. Aggie is predeceased by her parents Bill and Mary Lewis, husband Tommy Blyan, sons; Trevor, Ralph, Clifford, Peter (Jr.) and infant son Dale, grandson Kenneth W. Pruden, 2 infant great-grandsons, son-in-law Kenneth F. Pruden, sisters; Gertrude Desjarlais and Mildred Blyan and brothers; Leonard and Edward Lewis. Friends and Family are invited to pay their respects between 7:00 P.M. - 9:00 P.M. on Monday, January 28, 2019 at the Athabasca Community Chapel. A Funeral Service will be held at 11:00 A.M. on Tuesday, January 29, 2018 at the Athabasca Community Chapel. A Celebration of Life will be then be held at the Buffalo Lake Community Centre immediately following the service with dinner to follow. The Pallbearers are Jason Blyan, Marc Blyan, Cameron Bourque, Preston Pruden, Shawn Sound, Eric Thompson, Aiden Drury and Kyle Blyan.